This is the Colombian Los Vascos brought to you by Noble Coffee Roasting. This fully washed coffee was grown by the ASOTBILBAO Cooperative in the Bilbao, Tolima region of Colombia between 1,650 - 1,950 meters above sea level. 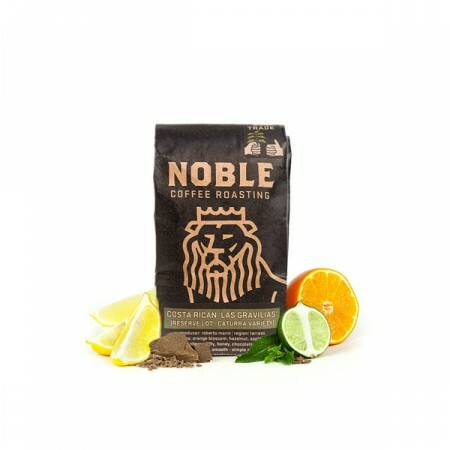 We love this coffee for its nuanced notes of chocolate and citrus zest, with a rich overall quality. chocolaty, clean sweet uniform - broad acidity. Would like coffees that are bit more dynamic. Probably more like 3.5 stars but overall we are enjoying the coffee. The Colombian Los Vascos was far better than the Brazil Espresso as far as taste and roast profiles we typically enjoy. The Brazil was too dark of a roast and the Colombian is just about right. As far as taste profile goes I think it was slightly acidic with some fruit forward notes coming through but you definitely could taste some chocolate notes as well. We almost always are brewing our coffee with an AeroPress so the body is typically smooth and this bag was not much different. Overall we would say these beans produced a pretty good cup of coffee (slightly simple) but not as full of flavor as others. We are still interested in trying an African bean along with a natural processing method.Thank you so much - we are really enjoying trying different beans from different roasters! There are some great traits about this coffee. One is the hint of chocolate and mint. With drinking coffee a tad hotter than warm, a lot of coffees tend to be too acidic. This coffee doesn't turn when colder. mild fresh aroma, crisp clean taste. Very nice sweet cup with creamy acidity. Notes of cocoa with very slight floral characteristics. Decent- a little on the weak side.